BSM Media is a full-service, integrated marketing and media company specializing in connecting moms and their families with brands and their products or services. No, you first. When it comes to our clients, we listen first. Nobody knows your business better than you and with this in mind, we actively listen- then ask and strategize. We want to learn what your goals are before we start overlaying our expertise to your brand or product. Then we work backwards. Yes, that’s right, backwards. We build marketing programs based on what we know will work and then maximize our resources to fit your budget. How do we know our plan will work? Because we’ve been focused solely on moms and their families for almost 2 decades. A lot goes into our customized marketing programs- expertise in the mom market, the latest consumer trends and fresh market research. Once we gather all of this, we challenge ourselves to exceed anything we’ve ever done before by creating an innovative and customized marketing plan that over-delivers on your goals. Let’s face it. Size matters and our size contributes to your success. It assures a personalized experience, allows us to be nimble and eliminates the waste of multilayered management fees. We think about what’s best for the client. We build the program based off consumer behaviors and what we know will work. We love to challenge ourselves to do something new. The industry likes to talk about disruption. We don’t. We stand behind a classic approach to marketing, one of insertion. We believe disruption is associated with your product or service but when it comes to marketing, insertion is key. We insert brands into consumer behaviors that we know already exist. Everyone knows it’s harder to change a behavior so, instead, we leverage existing behaviors to create a natural, authentic and organic connection. We don’t change behaviors. We identify existing consumer behaviors and trends that make sense to align brands with. Every move is selective and strategic; you won’t have to worry about wasting your time or budget on knee-jerk reactions or on shifting ideas to follow trends. We’ll get you there without the run around. We know what motivates, inspires and engages them. No one is more published on the subject of marketing to moms than our fearless leader, Maria Bailey. From the United States to Korea and countries in between, her books adorn the shelves of learning institutions and the night stands of business leaders across the globe. However, our expertise doesn’t stop there- our team has executed over 1,000 marketing to mom programs for more than 500 Fortune 100 brands. We don’t just know moms, we are moms. We know the 3am wake-up calls, the mad-dash morning runs to school, the “I need this new piece of equipment for practice”- we’ve been there and we know the brands and products that will make mom’s life easier. We know their families, their lifestyles and their motivations. We personally know influencers, trend setters and next generation leaders. 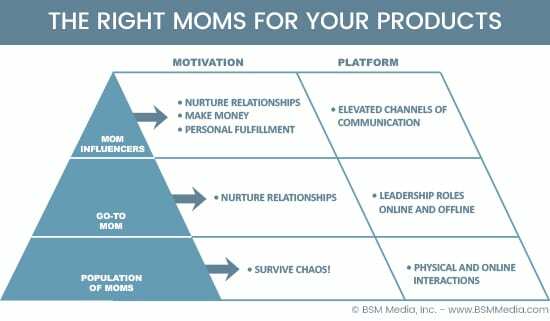 As a leader in the market for so many years, we’ve built longstanding relationships with the brands, organizations, events and media that are impacting moms. Now there’s a phrase not typically associated with marketing agencies! BSM Media takes pride in being nimble, flexible and available to our clients when they need us. With you every step of the way, the BSM team communicates with you throughout the entire process. We take our work seriously but if we didn’t sprinkle in some fun, we wouldn’t find the success we’ve always had with our campaigns. Our extensive experience and deep relationships allow you to avoid costly mistakes or utilize resources to test concepts, recruit moms or find the right partners for your project. We boast a legacy of internationally recognized and award winning programs such as, Disney Social Media Moms Celebration, Huggies Mom-Inspired Programs, Zhu Zhu Pets, National College Move-In Week and Beaches Resorts Social Media on the Sand. The list goes on and on. We challenge ourselves to create marketing programs that raise the bar in forming long lasting relationships with Moms.